Where is my head ??? 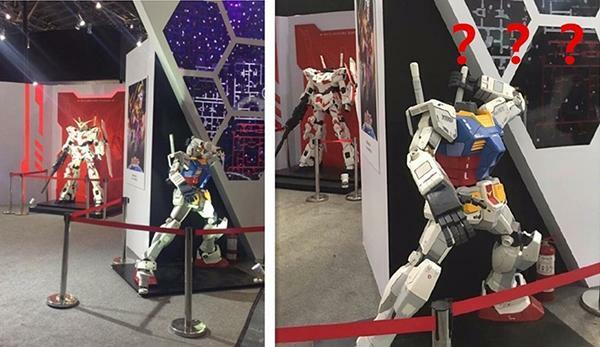 A thief who stole headpieces from two life-size plastic gundam models confessed he did so to drive away evil spirits. The suspect took the items from the 13th China International Cartoon and Game Expo, held at the Shanghai World Expo Exhibition and Convention Center, on July 10. Staff members found that the headpieces were missing soon after they were dismantled and put to one side ready for repackaging and removal on the last day of the exhibition. Fortunately, the tea-leaf was captured on the same day thanks to the help of a surveillance video. The man allegedly confessed he stole the models in order to drive out evil spirits and guard his home. The story tickled many on social media with several netizens admitting they were unaware that plastic products could guard a home. Others joked that there was no hurry to locate the thief as he would reveal himself when trying to sell the stolen goods on an online second-hand goods trading platform. Gundam models, as well as the hobby of assembling and painting them, is known in Japan as Gunpla, a portmanteau of "Gundam plastic model,” plastic being the most common material for the retail kits.